You are in for a fun treat at the Cuttlebug Challenge blog this week!! Valerie Salmon, owner of "Got Sketch" and "Got Crafts", has provided us with a sketch to base our projects on this week. This is the sketch for your "Be Inspired #20" challenge. And here is my card based on it! I dry embossed the bottom and right side edges of the kraft cardbase with my Cuttlebug and the dotted "Just My Type" embossing border. After that I dry embossed a 1/2 inch strip of kraft cardstock using my Cuttlebug and the dotted "With Love" embossing border. Once the dry embossing was done, I layered some patterned paper and the embossed strip to the front, and accented with a felt flower and jewel flourishes. I then added the sentiment rub-ons directly below the embossing to give it a simple feel, but still make it stand out. If you are ever looking for a store that has a good stock of embossing folders (or Cuttlebug product in general), I recommend CreativeXpress. They almost always have the items you want in stock, and are always putting items on sale. This is where I get all my Cuttlebug product from, and they ship really fast too! Did you print it yourself? Great take on Valerie's sketch! Wow, I love your colour combo Lea, it's just gorgeous! Great card with of course, such gorgeous details! Beautiful flower, beautiful bling, beautiful embossing, the list just goes on! Great take on the sketch too. Fantastic colors, and I love where you chose to Cuttlebug! Gorgeous card! OH what a pretty sketch, (I haven't gotten to that blog YET) and your card is BEAUTIFUL!!!! So pretty! I really love all the bling! Great job! OMG!!!!!! 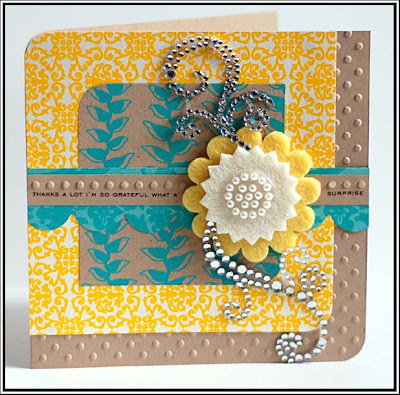 I so love the clean look, the colors, the papes, the way you used your cuttlebug, the bling, WOW, WOW....such a gorgeous take on the sketch!!! Love it, big time! Wow, Lea! This is super fabulous! Those colors and the flower and the bling...wowzer! This is simply beautiful, Lea! You know how much I love the swirls, and you've combined them so well with all of the different elements in this project to create a fabulous card! I love the papers you used and the colors simply pop! 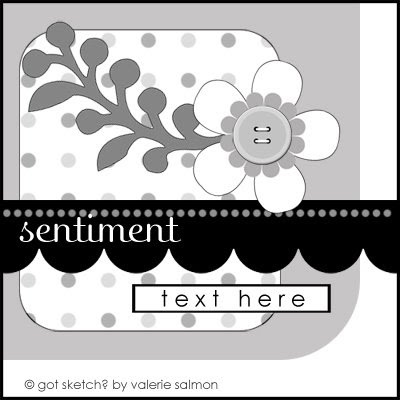 The rub-on sentiment looks fabulous along the row of embossed dots! I love it! Lea I just love this!! Awesome job girl!! You know what's funny? Yesterday evening I was talking to my other half who said he loves the combination of yellow and blue and I said, that I am not a fan of those colours together. Well Lea - you have just changed my mind because this card ROCKS!!! A wonderful card! I love it! This is a gorgeous card Lea! Love the bling! Lea I LOVE your card this week, you always use such cheerful colors! I love the rub-ons below the embossing, definitely makes it stand out! And I did use the new Sassafras paper on my card this week, just love it! I bought mine at Emma's Paperie - free kit if you spend over $50, free shipping over $100, and a 10% off code for your next purchase - can't beat that! Love what you did with the CPS and Valerie Salmon sketches!!! I sat down last night to do my CPS sketch and had scrapper's block. Didn't come up with a thing. I am going to think on it today!! Thanks as always for the inspiration!! You rock girl!! THat is one beautiful card! Just jumped over from VP to say hello. Your card for this week is fabulous! Gorgeous as always & your PTI cards rock!!! the colors are fabulous on this! could NOT love this more, you owned it! hugs & so much love! Gorgeous, eye catching card!! Fabulous color combo! gorgeous Lea love the use of the felt flowers and that flourish is to die for. Love the floral centerpiece, color scheme...well...love the whole card! Love the sketch, I think I will use it!